In 1988, an 11-year-old Chris Chillemi witnessed his brother and his sibling’s friends creating graffiti works, the young Staten Island native deciding to photograph the results. By about two years later, Chillemi had begun doodling his own designs on public surfaces, the artist eventually became obsessed with drawing geometric 3D cubes which evolved into television set depictions before transforming into boxy robot forms. And around 1999 this direction led to Chillemi creating a more emotive robot named P.O. B.O.Y., or Prosthetic Organic Bot Of Youth, whose sympathetic eye holes and slightly hunched stance made him a counterintuitive choice as the unofficial mascot and promotional tool for the artist’s online endeavor in 2001, RobotsWillKill.com. Evidently never having completely abandoned his desire to catalog and preserve the temporary art he was seeing, Chillemi launched Robots Will Kill with his friend Kevin Mahoney, who helped with the technical side of the website, an online repository for graffiti artists and admirers worldwide to share and enjoy pictures of street art creations. Quickly becoming a much-loved resource for fans of this particular artistic expression, Chillemi himself acquired the alias ChrisRWK, the last three letters being an abbreviation for the site’s name. 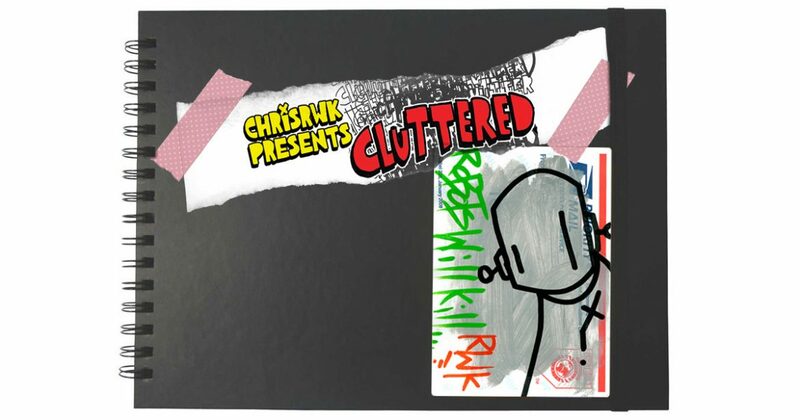 And while both the site and the artist have evolved greatly over the last 17 years, ChrisRWK remains committed to exposing the art he loves to a wider audience, an endeavor that has led him to curate a bounty of group exhibitions for various galleries, including the recent Cluttered showcase which features several designer toy artists and sculptural works. With the benevolent appearance of ChrisRWK‘s now-iconic P.O. B.O.Y. welcoming attendees to enter the Clutter Gallery space, the topmost area of the window display treats passersby to some of the sculptural works contained within. Bookended by a pair of Mike Egan‘s free-standing, double-sided paintings on hand-cut wood boards, as well as his five-piece Death Blocks Set, all of the other pieces included here reference the street art leanings of the show’s curator. Filipino artist Quiccs uses his own 6-inch tall TEQ63 vinyl form to pay homage to ChrisRWK, meticulously adorning the robotic entity’s hoodie attire with hand-painted P.O. B.O.Y. renditions, the finished work appropriately titled Robots Will Kill. And perhaps Quiccs’ creation is contemplating decorating the untouched surface of Kyle Kirwan‘s Brick Bloom, a version of the artist’s recently debuted Box Bloom design (learn more here) that has been carefully coated in a textural brick-like patterning. Emitting forth from Kirwan’s piece is a sign declaring “Post No Bills”, the phrase referring to many cities’ laws which forbid the posting of handbills, posters, and graffiti on public property, which explains the piece’s “virgin” exterior. But such warnings don’t always discourage artists, as KIDLEW subtly reminds with his piece, an emptied spraypaint can that has an MTA subway map affixed around it, the subterranean locale being a frequent home to illegal graffiti tags. Further expressing his own street art story, KIDLEW has decorated the exterior of this piece with a swath of red as well as renditions of his own long-standing Lumpy Bumpkin, or Lumpybumpkin, character. And this perfectly leads one towards ChrisRWK’s collaborative contribution to the window display, a trio of Cans Will Kill pieces using czee13‘s colloquially titled “canbot” form as a basis for the Robots Will Kill founder to decorate with various tags and P.O. B.O.Y. renditions. While better known for grisly and gory sculptural works, Californian Jay222 is no stranger to interpreting the feline form, arguably the most notable being his 75 uniquely hand-painted and/or embellished renditions of Alex Pardee‘s “Tupac Cat” meme that he made for Zerofriends’ San Diego Comic-Con booth in 2011. Thus it wasn’t a complete surprise when Jay222 revisited designing and sculpting the meowing and purring beasts with his ChubZ the Cat creation, a vinyl form initially issued by Max Toy Company in September of 2016. Featuring a bulbous and oozing fur coating its hide, the artist employed this base for several of his contributions to the Cluttered exhibition, including the Cherry Cola ChubZ with its sculpted tongue and inserted doll eyes, the Blueberry Clear ChubZ in its translucent glory, and the crystal clear ChubZ vs Jaws containing its hand-painted mini shark bust erupted from sea of blue resin. With Jay222 having revisited this later concept several times since first conceiving of it in September of 2017, he also contributed a stand-alone copy of the mini bust, titled simply Shark, and a new rendition of the larger, snapback adorned sculpture he originally created for art and streetwear store Cukui in 2016, herein titled Shark Mouth. But Jay22 is not the only artist to revisit and refresh former designs as KIDLEW digs deep into his oeuvre to bring forth two hand-painted resin Lumpy Bumpkin interpretations, a form that was first issued at New York Comic Con in 2009. Exhibited with its original white body as well as a glow-in-the-dark variation, Lumpy Bumpkin‘s solid form has been advertised as being “the toy that doesn’t do anything”, representative of how the character’s “purpose in life is to do as little or nothing at all”. And, for the final sculptural works on display, Task One contributes the Crystal Ball Labbit Family, an impressively transparent resin casting of Frank Kozik’s rabbit-like form with shimmering flakes suspended throughout the solid cast bodies. Representative of a direction the artist has been exploring since October of 2017, this Crystal Ball Labbit Family may not actually allow one to glimpse the future but it accomplishes what all the works in the Cluttered exhibition do: providing insight into as well as documenting the past and present of the artist’s inside.